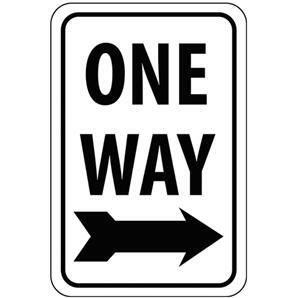 With so many things to do in the Orlando area, it's hard to know which to do first! From Sea World, Universal Orlando Resort to Disney World and Epcot Center and more, there's just a ton of things to do and see. 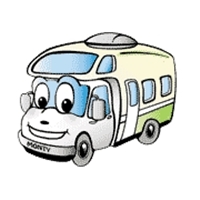 Rent an AF, FS or TS model motorhome from our Linden, NJ office on or after October 20, 2014, and return to our Orlando, FL office no later than January 20, 2015 and receive $45 off the nightly rate for the first 10 nights, no one-way fee, plus 1,200 free miles (additional miles extra)! The Chase for the Sprint Cup race at the Kansas Speedway on October 5! The Bank of America 500 race at the Charlotte Motor Speedway on October 11! The Good Sam Roadside Assistance 500 race at the Talladega Superspeedway on October 19! The Goody's 500 race at the Martinsville Speedway on October 26! The AAA Texas 500 race at the Texas Motor Speedway on October 30 - November 2! Our featured Campground of the month is the Lake Conroe RV & Camping Resort in Willis, TX! Thousand Trails is some of America's finest family camping resorts, and Lake Conroe RV Camp is a great example of what family camping is all about. This RV campground in Texas is a water lover's dream come true. You can rent one of their jon boats, paddle boats or canoes so you can fish to your hearts desire! Other amenities to enjoy there are tennis courts, children's playground, mini golf, pool, swimming pool, shuffleboard, hot tub, bike trails, fitness center and more! 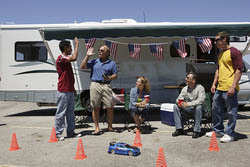 Lake Conroe and the RV camp are open year round and offer lots of variety for the entire family to enjoy. 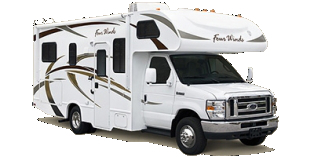 Their staff is very friendly and looks forward to serving your needs, and at Lake Conroe RV Camp, they have 24-hour gated security. If you're an archeology buff, then you'll want to have Alibates Flint Quarries National Monument on your bucket list. The monument protects a mesa covered in a carpet of flint, so thick you can't walk without stepping on human generated flakes of Alibates flint. 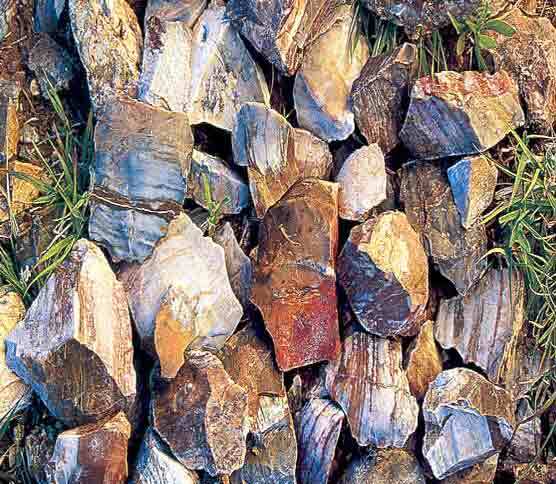 The quarries were dug by hand 1,000 years ago, however, gathering of flint from the mesa has been taking place for 13,000 years. Plains Village Indians lived here in large permanent villages and smaller, outlying farming and gathering communities. Villages were built of rock-slab houses from one to 100 rooms. They were typically single-unit dwellings, although some rooms were connected. Tours are provided at no charge, however they do require reservations. 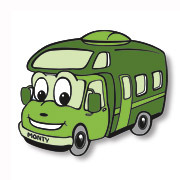 When considering nearby attractions, please remember that El Monte RV motorhomes are prohibited from driving off paved roads. 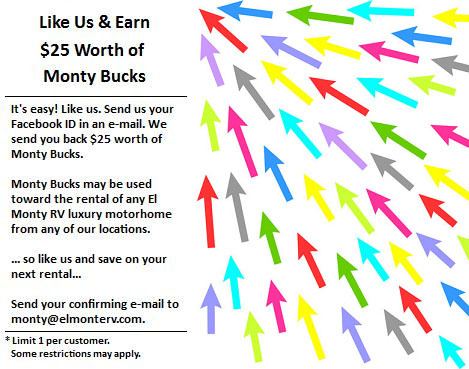 The closest El Monte RV rental location is in McKinney, TX. However, if starting your trip from another location is more convenient, we also have many other rental offices, so please visit our locations map to find a location that may be more suitable. ~ Mix ground beef, eggs, Worcestershire sauce, A1 sauce and 2 packets of soup mix by folding in ground beef around it. ~ Gently press patties to desired thickness and size. ~ Cook patty on grill over medium heat until done. ~ Cook bacon until crisp and pork until golden. Place patty, cheese, bacon and pork on a bun with A1, ketchup, BBQ sauce, pickles and salt and pepper. (Recipe courtesy of "I Got Your Tailgate Party Right Here - The Best of the NFL: NFC Edition"